Gerbera daisies are one of my favorite flowers. They are so cheerful and beautiful I can’t have enough of them! 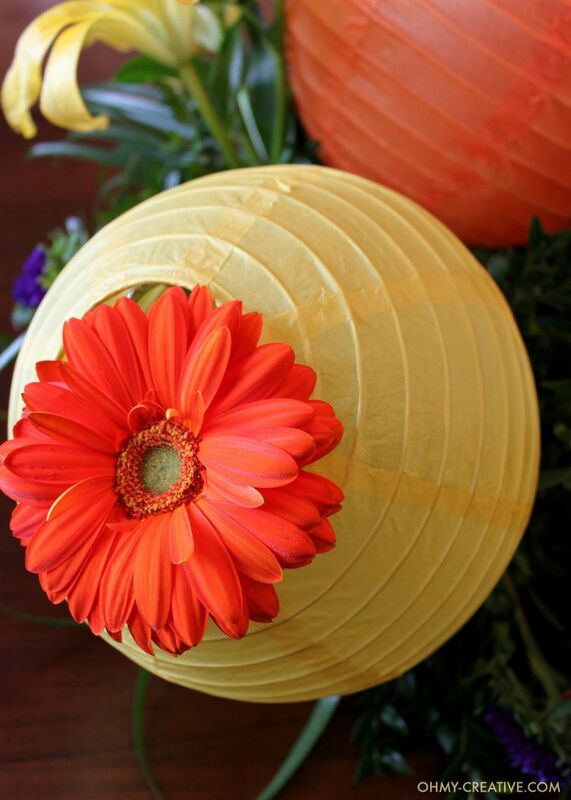 The incredible vibrant blooms make them a perfect flower for this Gerbera Daisy and Paper Lantern Centerpiece! A gorgeous centerpiece perfect for bridal showers, weddings and summer parties! 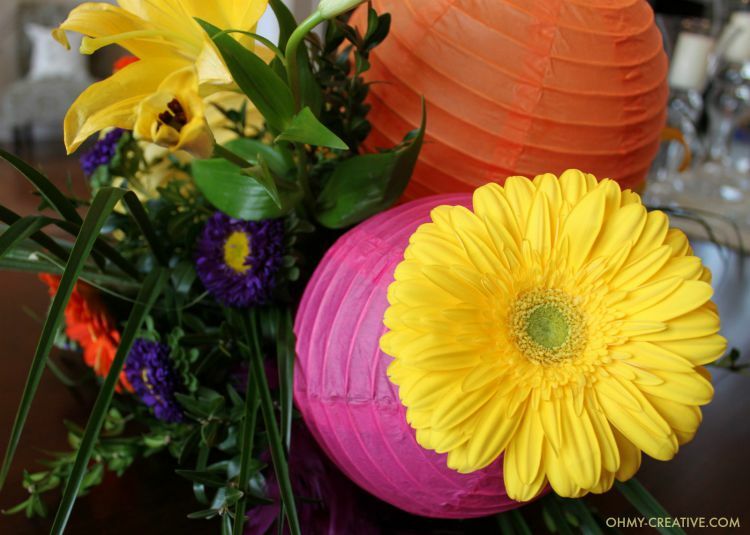 This Gerbera Daisy Centerpiece would make me happy just sitting on my kitchen table! 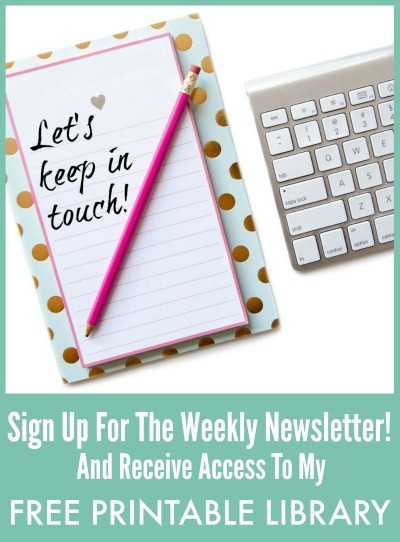 It’s a party just waiting to happen…ha ha! Ya know I like a party! Look at the gorgeous color of these blooms! 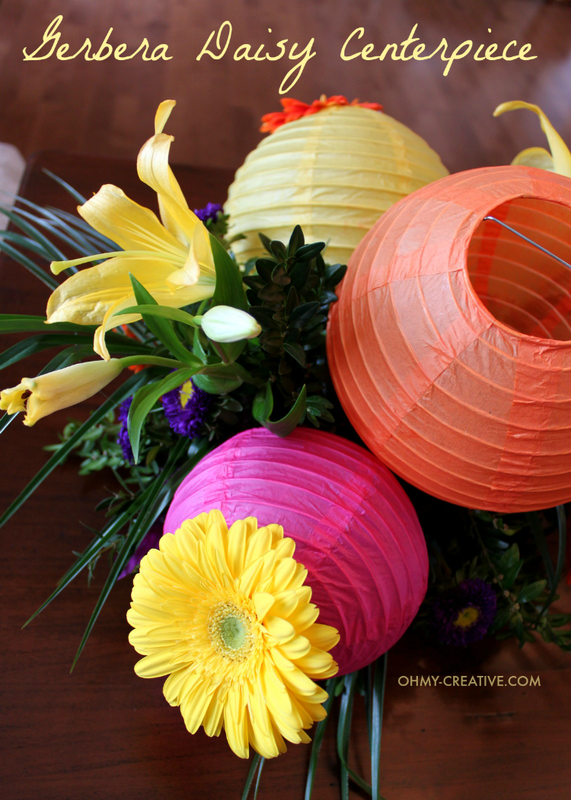 I love the contrasting colors of paper lanterns too. The color pops! This centerpiece is not hard to make. Pick up a selection of brightly colored flowers, including the Gerbera Daisies, yellow lilies and maybe another smaller brightly colored flower like the carnation. Even a small button style flower would work. 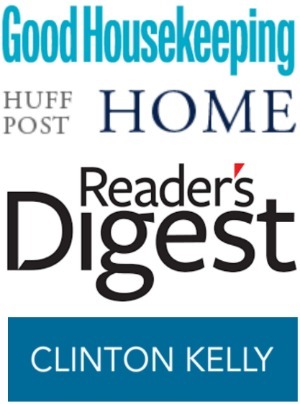 Purchase a few greens like ferns or boxwoods that were used in this centerpiece. If you’re lucky, you have boxwood growing in the yard to clip! 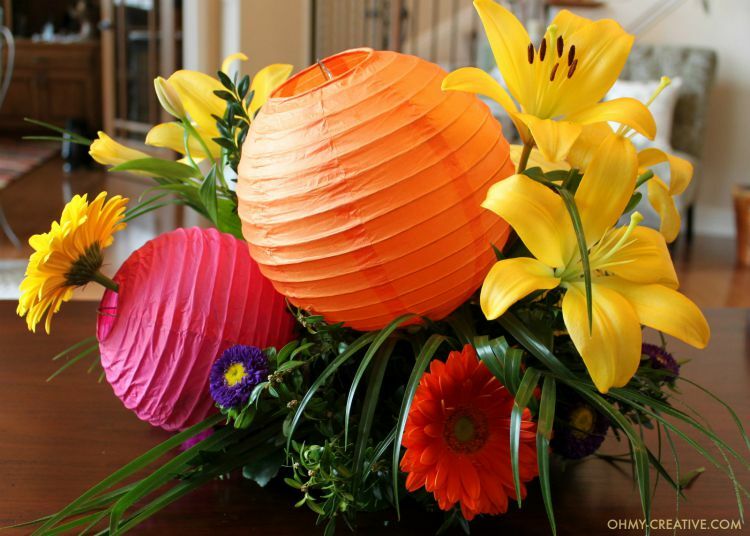 Shop at a craft store for paper lanterns, small floral dish and floral foam. 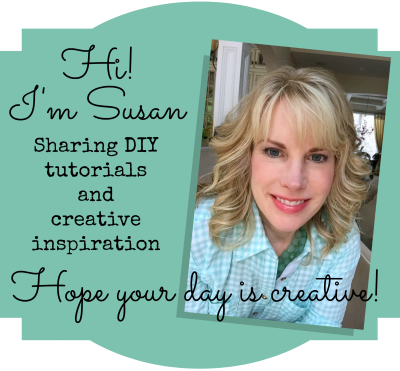 A few optional items that may be needed to complete this centerpiece – floral tape and floral picks. Tape the floral foam to the dish and gently press flowers and greens into the foam. 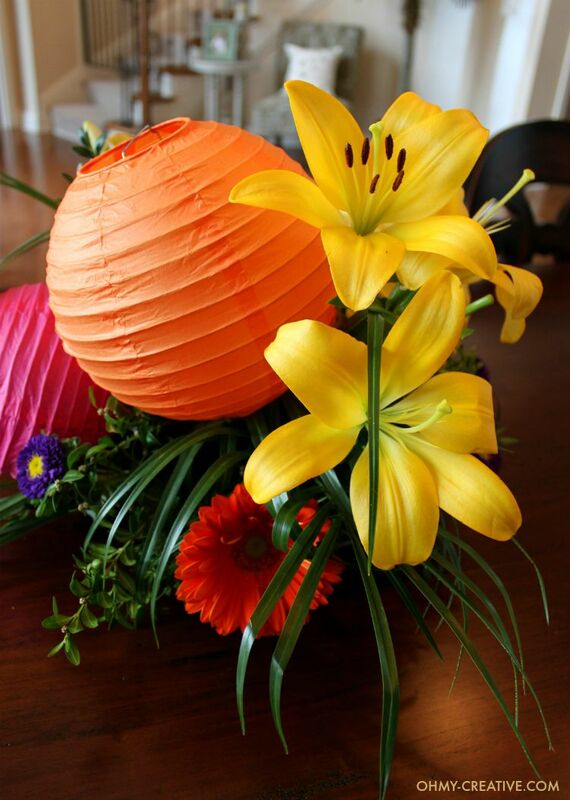 You may need to anchor the lanterns to the centerpiece using floral picks then pass the gerbera daisy through the lantern and into the foam. That’s it! Super easy and bursting with color!